these girls are so creative! We introduced the "tiny living movement" which is nowadays quite active in USA. We were surprised about the amount of possibilities about "living small-tiny". These days we are working on it. Results will come in just a couple of days. On the 31st October was Halloween, as you certainly know. We did several activities at that time. One of those was called "Trick or treat". We explained briefly what it consisted of, then we played it at class all togehter, giving sweets to all the students for having done it so well. After that, the students coloured a worksheet about one of the characters of that celebration: a witch. The results were fantastic but, unfortunately, I forgot to post them. This week we focused on clothing. We started learning the most useful words about that topic through different activities at class. One of these activities is shown below. The next week we will keep focused on this topic, by using different activities at class and outside, too. So, we wish to show you some new stuff about it very soon! ENGLISH AND PLASTICINE AT CLASS! Some days ago the 1st grade did an special activity with plasticine. Moulding it to make forms of some of the animals we had been learning a few days before. Who what where and how. 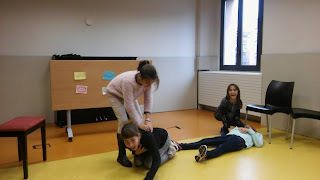 With 5th grade students we have been doing theatre while using the question words: Who, where, how and what. 5th grade. Sherlock Holmes at Pia Church. We worked with the english language, but in the darkness! We had to answer a quiz about Sherlock Holmes. The answers were writen in hiden cards spread in the church of the school. Therefore, we needed to use some torches, and remember about the information of the cards in order to match the answers. 1st grade. Plaça Clarà Hunt. We had some beautifull days of bright sun! So we decided to take our lessons out of the school. As soon as they detected the items of a list, they had to announce it: "I can see...a traffic light, a group of 3 people, a mother with a baby...". It was a nice activity of searching full of surprises. We also had a great time playing with the leaves and the fountain. I leave here the beautiful photos of that day. Enjoy them. 5th grade. Press report about St.Lluc. you'll remember that we visited St.Lluc Fair, having a look to the exhibition of pictures, as good reporters. We took pictures, we chose our favorite pieces, and voted on it. So here is the result of our "jornalism day". This ppt is a press report about that day. We decided to update the main picture of the "team", since Joel recovered after his accident and Claudia joined the group. So here you will see the team we are on tuesdays. 1st grade. My Birthday Calendar. We sometimes forget the date of my friend's birthday. Does it happen to you also? So we made our own birthday calendar, asked our english mates, and wrote down their names in the correct date. We also asked about preferences of colors, likes...? So we added some decoration on the name in order to remember the likes of our special friend. The students made their own circuit with a long rope. Then they had to find the products of their shoppinglist....but...they couldn`t touch the red rope.. because otherwise , they would lose a card. Watch out !! Don't touch the red rope ! P4 I like.............We played different games and restaurant about food. We went to plaza Clara to find autumn leaves and try to find the different colours,green.yellow ,red orange brown.We had a lot of fun! We sang a song with gestures;Wnen there is sun and there is rain...there is a rainbow ..there is a rainbow....there is a rainbow in the sky. 6th grade. Time for origami. We were thinking again on fashion things... and it was a great surprise to find that clothes can be done by paper. This is the origami paper work. 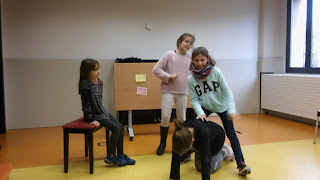 First we followed some instructions of american videos and after learning, we were ready to act as youtubers and be the ones to describe every step in english. The last two weeks we have been focusing on learning directions and prepositions of place in a fun way. Firstly, we made a grid to learn key words like forward, backward, left and right. Secondly, we have introduced prepositions of place through different activities like videos and worksheets. As a whole, we have learnt what means "take a step... forward, backward, to the left, to the right" as well as the main prepositions of place: in, on, at, under, behind, over, in front of and so on. Here a couple of links where you can find some of the material used at class. And a photo as a sample! 1st grade - A group. Discovering a foreign tradition: Trick or treat! During the previous week of Halloween we discovered a foreign tradition: Trick or treat. We finished it colouring a draw of a sinister witch. Here two photos of the nice drawings made at class! 3r grade. Learning and playing: "What's up" and "Kaleidos"
We have played at two board games that are thought to gain vocabulary as well as improving our memory. After celebrating Halloween it was time to come back to class to keep on learning English. Forward, backward, left or right"
We enjoyed preparing all the stuff needed and then playing it actively! Second grade was working on Halloween topic. We used a very funny song, The Ghost Family , to practice some language and dance around the class. They also create some masks to improve the performance. And the result was this fantastic and friendly "Ghost Family"
The 2nd grade Ghost Family! 5th grade. Our own monsters. Halloween brought us the idea of sewing some monsters from our socks. Why not? We needed sooo much concentration and focus! However, the task was our goal and each one of us decided to design a different monster. For sure we have learnt these things in regular lessons, but this was an opportunity to use these expressions in real situations and with it, training the spontaneity in english. We were sewing for a couple of days in order to get them ready ... and then, a new proposal from the group arised: why don't we do a short movie with them?? And again ... why not? So this is in process right now. Isn't it nice when the students feel that they can develope their own ideas, and the fact of using a foreign language do not stop or block them to go for it?! ?